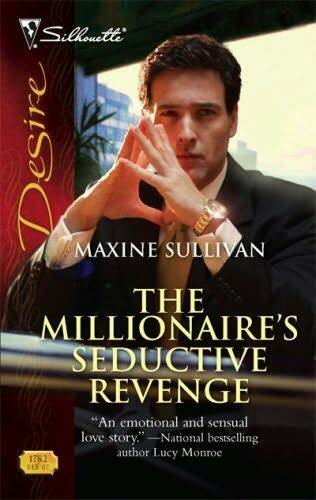 In “The Millionaire’s Seductive Revenge” by Maxine Sullivan, undeniable desire is fueled by underlying need. Brant Matthews looks upon Kia Benton as a self-serving money-seeker who uses her beauty to obtain what she wants. Kia sees Brant as a seducer and user of women, reminding her of her own wayward father. The fact that Kia works for Brant’s partner, Phil, as his personal assistant only adds to Brant’s speculations about Kia. When she appears to become engaged to Phil, Brant’s anger is as raging as his desire. He wants Kia for himself, and he determines to beat her at her own game. Soon, their attraction cannot be denied, and physical want overcomes logical thought. However, Kia and Brant each have a deep longing for more than just physical intimacy. Can they find true happiness in each other’s lives? An intensely passionate and compelling love story, filled with strong romantic imagery. This is the first book in Maxine Sullivan’s “Australian Millionaires” series, and I very much look forward to continuing the series! Line bottom of the trifle bowl with 1/2 of the ladyfingers. Sprinkle with half of rum or brandy. Prepare vanilla pudding according to package directions using 4 cups milk. Top ladyfingers with 1/2 jar strawberry preserves. After pudding is partially cooled, put 1/2 pudding on top of preserves. Add a layer of 1/2 fruit (peaches and berries). Repeat using the remaining ladyfingers, rum or brandy, strawberry preserves, vanilla pudding, and fruit. Whip the cream — adding 1/2 ounce rum — and frost the top of the trifle. Garnish with remaining berries. Refrigerate. Can be made 1day ahead. Combine mayonnaise, creamed horseradish, tomato ketchup, and lemon or lime juice into a mixing bowl. Stir in prawns or shrimp and combine well so that all prawns or shrimp are coated with sauce. Divide the torn lettuce pieces between 4 large wine glasses and top with the prawns and sauce. Decorate each glass with a wedge of lemon or lime. Blend all ingredients (except berry garnish) in blender until smooth. Serve in two tall stemmed glasses. For garnish: Make a slice across bottom of each strawberry and place on rim of each glass. In mixing bowl stir together flour, sugar, baking powder, salt, and nutmeg. Cut in butter or margarine until mixture resembles coarse crumbs. Make a well in the center. Stir in undrained pineapple and almonds until dry ingredients are just moistened (dough will be sticky). On lightly floured surface, knead gently 10 to 12 strokes; roll dough to 1/4 inch thickness. Cut with floured 2 1/2 inch biscuit cutter. Place on ungreased baking sheet. Brush each scone with milk and sprinkle with sugar. Bake in 425F oven about 12 minutes. Serve warm with creamy whipped butter and tangy-sweet marmalade.